I’ve been known to greedily pick them out of the granola as a snack, leaving walnuts and almonds behind for another granola eater. I might not be the best housemate if you like pecans too. But if you love walnuts and you live with me, we’re going to get along swell! My love of pecans started at a young age. My grandparents owned a pecan company when I was a kid. They sold beautifully wrapped boxes of pecans to businesses who gave their clients gifts like beautifully wrapped boxes of pecans as a way to say ‘thank you’. I have no idea if this kind of gifting is still a thing, but if someone gave me a box of fancy pecans, I wouldn’t hate it. In fact, since we’ve lived here in the U.K., several family members have sent us bags of Louisiana pecans and I have hoarded them, rationed them out, & essentially treated them like gold. We all reaped the rewards of my grandparents little pecan business. Their freezer was always packed with bags of shelled pecans ready for baking, cooking, & snacking. We put them in the usual suspects like pecan pie, sticky buns, and quick breads, but we also added them to things like “nuts & bolts” (our homemade Chex mix) & cranberry sauce. I had a childhood filled with pecans, which is probably why I’d argue that pecans make just about anything better. In this particular bread, they not only make it better, but they are the star. The quick bread batter, swirled with brown butter & brown sugar, plays host to the toasted pecans which are gently folded in. 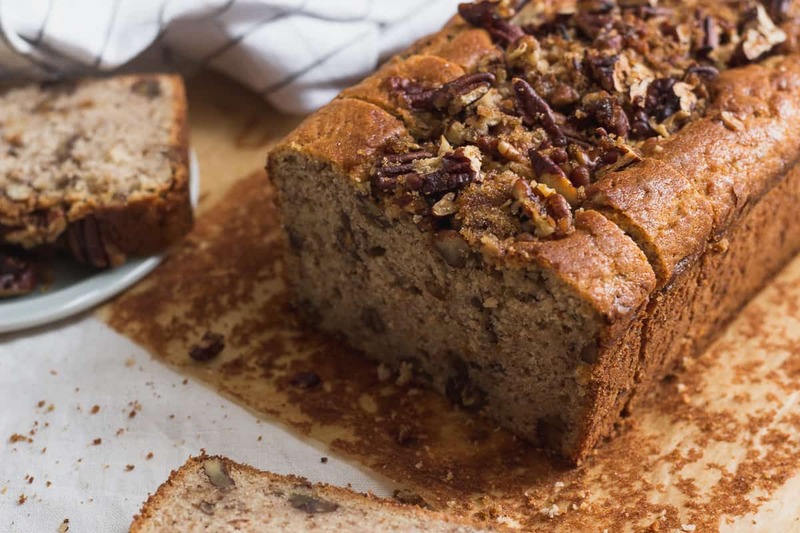 All of these elements create a nutty, caramel-y, perfectly sweetened bread studded with golden pecans. 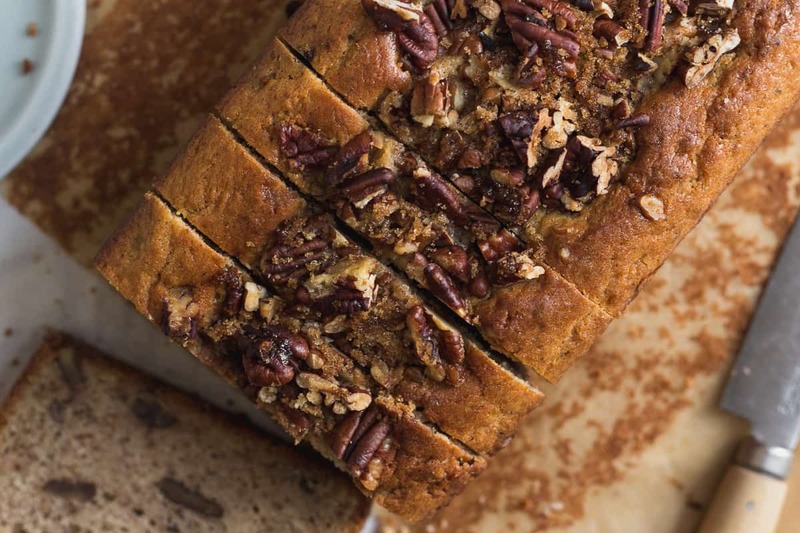 Since pecans make everything better, top the bread off with more crunchy pecans & brown sugar. 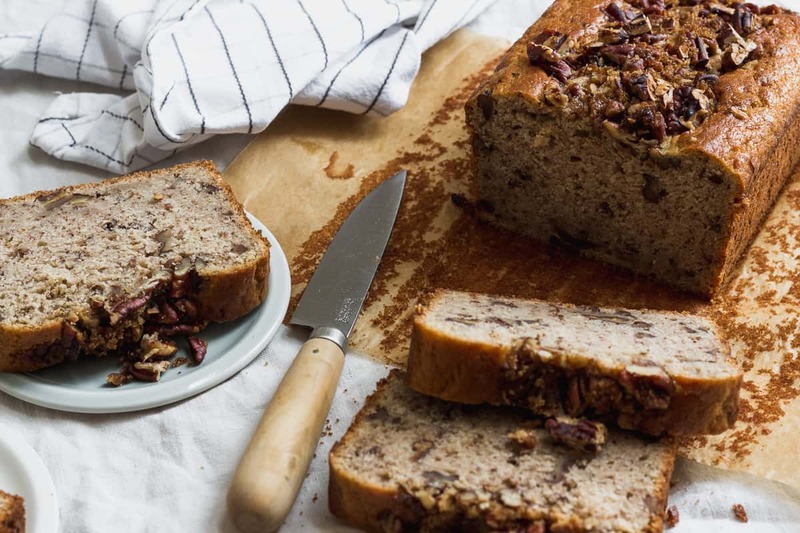 As the loaf bakes, the sugar melts around the pecans, turning the topping a lovely, sticky texture. 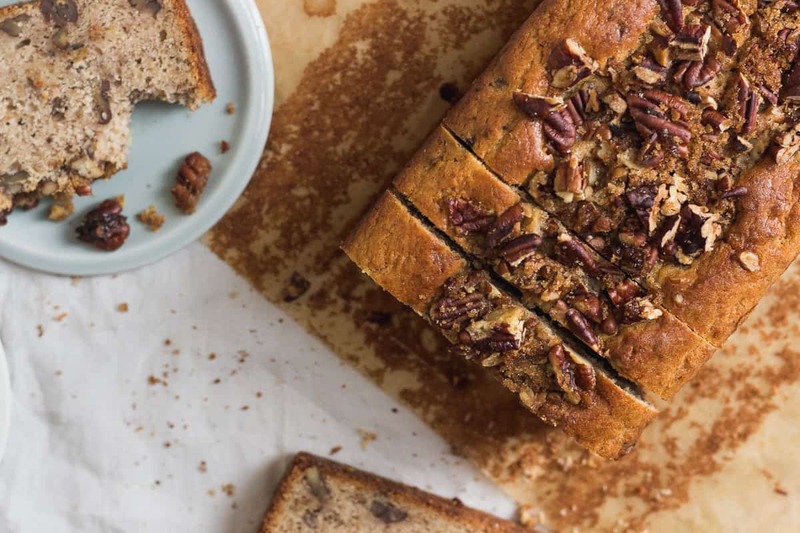 In each slice, you’ll get the best of everything–soft, nutty brown butter loaf & crunchy, caramel-y pecans. 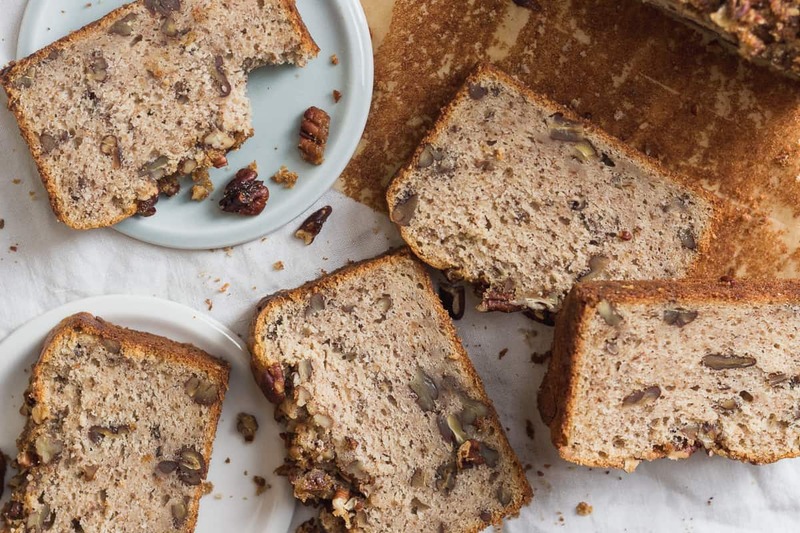 This brown butter pecan bread is the perfect thing to whip up for a little weekday treat. It’s simple and delicious and just the perfect amount of sweet. Preheat oven to 350*F. Grease and line a 8.5"x4.5" loaf pan with parchment paper. Put the butter a small, lightly colored saucepan or skillet (so that you can monitor the color of the butter), over medium low heat. Let the butter melt completely stirring occasionally. The butter will sizzle and foam as the water begins to evaporate. Once the butter has calmed down a bit and isn't sizzling as much, begin whisking the melted butter. Whisk constantly until the butter is browned. You'll notice that it will smell amazingly nutty and fragrant. As soon the milk solids at the bottom of the pan have turned a rich golden brown color, remove the pan from the heat and pour the butter into another bowl immediately. Let the butter cool to room temperature while you tend to the other ingredients. Take 1/4 cup (1 oz.) of the toasted nuts and pulse them in a food processor until they are the consistency of coarse cornmeal (or if you'd rather not drag out the food processor for this job, just chop them with a chef's knife until they are that texture). Chop the rest of the toasted nuts roughly. Whisk together the flour, the ground up pecans, granulated sugar, light brown sugar, baking powder, and sea salt in a small bowl. In a large bowl, combine the milk, eggs, and cooled brown butter. Whisk these together until everything is thoroughly combined. Add the dry mixture, folding it in until just combined. Fold in the remaining toasted, chopped pecans. Pour the batter into the prepared loaf pan. In a small bowl mix together all of the ingredients for the streusel topping. Sprinkle this mixture evenly down the center of the cake. 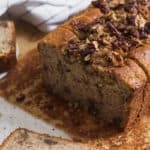 Bake in the preheated oven for 50-60 minutes or until a toothpick inserted in the middle of the loaf comes out with moist but not batter-y crumbs. Rotate the loaf about half way through cooking time. Remove pan from oven and let cool in the pan on a cooling rack for 10 minutes. Then remove loaf from pan and let cool on cooling rack for at least 30 minutes. Enjoy!